Romano peppers and Salmon Empanada.. The recipes! Posted by Wairimu in Fish & Seafood, What's cooking? 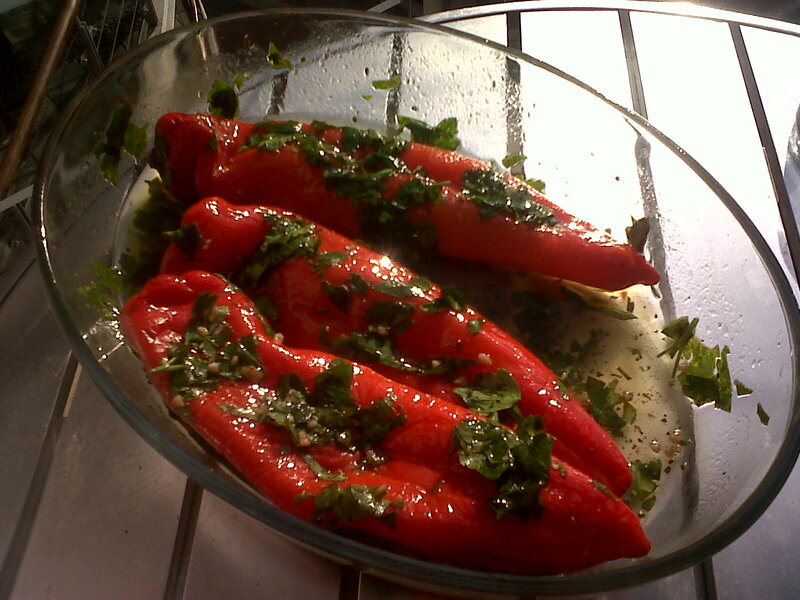 Marinated Romano Peppers (adapted from Ottolenghi The Cookbook). Preheat oven to 200°C. Spread peppers out on a roasting tray, drizzle about 2 tbsp olive oil and season with salt and pepper. Toss the peppers around to coat them in the oil. Roast for 15 minutes, until peppers are tender and the skin begins to colour. While the peppers are roasting, mix together the herbs, garlic vinegar and olive oil. Season quite well, the flavours should be robust. Put the warm peppers in a bowl, pour over the marinade and cover at room temp for at least 2 hours. To serve, lay the peppers out on a serving plate and spoon over the marinade. This recipe is great served with buffalo mozzarella and rocket as a starter. For this break the mozzarella into large chunks over the peppers, drizzle with the remaining oil and garnish with parsley. I have always had the perception that it would be hard to cook for a person who doesn’t eat meat, and I’m always afraid to cook without meat, I guess it’s a very Kenyan thing, no meal is complete without a piece of meat. I’m yet to cook a full vegetarian meal, but at least had the pleasure to cook Miss Y-vo this meal, Salmon & potato empanada (thank goodness she eats fish right?). I have been saying for years that I would make her a fish pie, and finally I got the chance, on the same day I was making my pork belly… It was clearly a great day for me! Preheat the oven to 180°C. Heat oil in a frying pan over a low heat. Add the onions and pan-fry until softened but not coloured. Set aside. Divide the dough into 2 portions, one slightly larger than the other. Roll out each on a lightly floured surface. Use the larger piece to line a pie dish (26cm approx). Put half the potatoes in a layer in the dish; spread the onions over the top, followed by the salmon. I used smoked salmon with dill and lemon oil (from Tesco). Arrange the remaining potatoes on top, season and pour the cream over. Brush the rim of the pastry with water, then top with the remaining pastry to cover the pie. Seal and cut away the excess pastry, leaving about 2cm. Cut 2 little holes in the centre to allow steam to escape during baking. Glaze the top of the pastry with the beaten egg. Bake the pie for 45-minutes to an hour, or until golden brown. Check out her blog- Passionate For Something More..